Juggling Frogs: Rainbow menu for Parshat Noah / "Parshat Keshet"
We read the story of Noah and the flood this week. Our family calls this "Shabbat Keshet" ("Keshet" = "Rainbow" in Hebrew.) We like to celebrate "Shabbat Keshet" with a rainbow-themed menu. 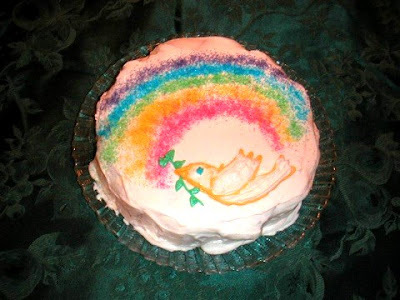 The rainbow part is made from colored sprinkling sugar, and a dove with olive branch is piped on top of it. It only requires tinting the smallest amounts of green and yellow frosting, the rest is the regular plain white frosting. The blue eye isn't piped, but tinted frosting applied with a toothpick, very quickly. 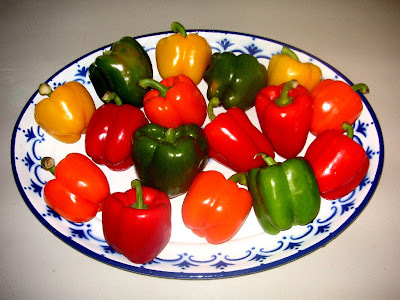 In past years, I've made rainbows out of crudites using red peppers, orange peppers or carrots, yellow peppers or yellow squash, green peppers, celery, green beans, (no blue! ), roasted eggplant or purple peppers. This year, my car's in the shop, so we're working with what's available. For a easy, and pareve rainbow dessert, I'm making rainbow "jello" (not Jello brand, but a kosher version called "Ko-Jel".) This takes a bit of chilling time, but hardly any effort. Clear out a shelf in the refrigerator for easy chilling. Set clear, short drinking glasses (or clear disposable plastic cups) on a cookie sheet that fits in the refrigerator shelf. 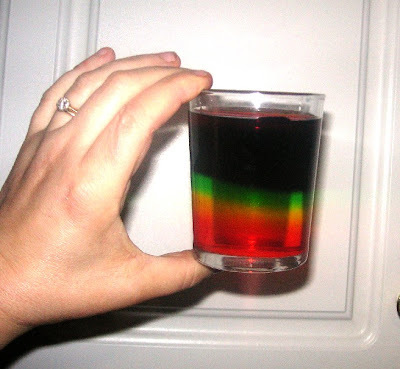 Make one color of "jello" at a time, in rainbow order, pouring it in the cups and allowing it to chill before moving on to the next color. When all the colors are made, it is best to cover the glasses, so the gelatin doesn't form a thick skin. I usually use another cookie sheet, inverted. I'm not sure how "real" Jello works, but the Ko-Jel brand will blend a bit at the borders between the colors. I like this effect, as it looks like a real rainbow, not simply stacked colors. 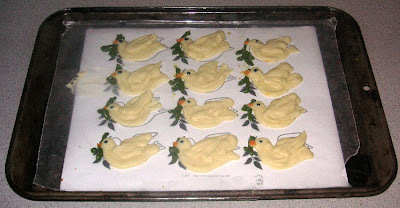 I like to serve these with a bit of tinted whipped topping and a white chocolate dove. These are made using the same techniques previously described in the Adventures in melted chocolate tutorial. Here is a chocolate dove template for making the doves. 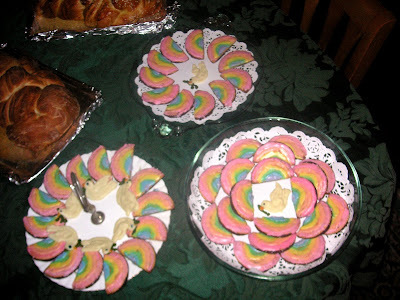 Some of the completed doves are on the plates of rainbow cookies below. Here's something I said about parshat Noach last year to parents of teenagers, at Back to School Night for our high school. Shabbat Shalom and gut chodesh! May we all find peace and a good place to rest. If you're planning something cool in the food or decorating department for this week's parsha - I need to know about it ASAP. My shopping is 40 minutes away so I need to think in advance! JF, just found this post while searching on the word "Keshet". I usually try to make a "mabul" cake for this parsha. With varying degrees of so-so-success. that's such a pretty cake! I love the idea of Rainbow menu! 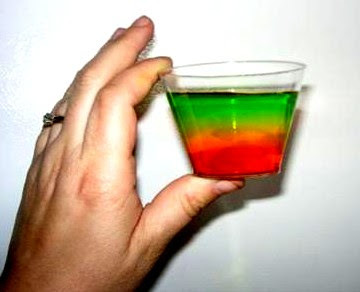 My mother would make rainbow jell, but we called it traffic light jello cause it was red yellow and green.